Donald Shoup brilliantly overcame the challenge of writing about parking without being boring in his iconoclastic 800-page book The High Cost of Free Parking. Easy to read and often entertaining, the book showed that city parking policies subsidize cars, encourage sprawl, degrade urban design, prohibit walkability, damage the economy, raise housing costs, and penalize people who cannot afford or choose not to own a car. Using careful analysis and creative thinking, Shoup recommended three parking reforms: (1) remove off-street parking requirements, (2) charge the right prices for on-street parking, and (3) spend the meter revenue to improve public services on the metered streets. Parking and the City reports on the progress that cities have made in adopting these three reforms. The successful outcomes provide convincing evidence that Shoup’s policy proposals are not theoretical and idealistic but instead are practical and realistic. The good news about our decades of bad planning for parking is that the damage we have done will be far cheaper to repair than to ignore. The 51 chapters by 46 authors in Parking and the City show how reforming our misguided and wrongheaded parking policies can do a world of good. Read more about parking benefit districts with a free download of Chapter 51 by copying the link below into your browser. 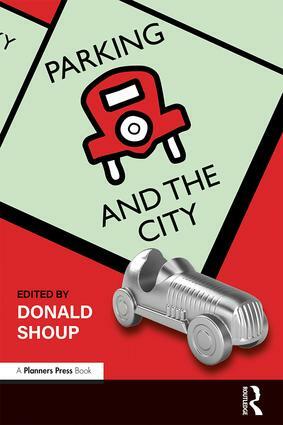 "In his landmark book, The High Cost of Free Parking, Donald Shoup, FAICP, argued that reducing subsidies for parking would reduce air pollution and traffic congestion as well as improve land use… In a follow-up book, Parking and the City, Shoup and 46 other contributors examined the results of these reforms in practice and found important benefits for cities, the economy, and the environment." "In recognizing Shoup's decades-long work to improve transportation and land use by reforming cities' parking policies, the American Planning Association placed him among other well-known authors including Rachel Carson and Jane Jacobs." "Shoup's writing is as incisive and entertaining as ever. The imperative of parking reform—in a year of wildfires, floods, and transit systems choking on lack of revenue and riders—has never been clearer. Parking and the City is a perfect follow up to a classic work." "For those who seek to manage and reform parking—and for urban planners, developers, transportation specialists, and policymakers—Parking and the City is an indispensable resource." "Don Shoup has done more to revolutionize the way we think about parking than anybody on the planet. His latest book tells the story of the impact his ideas are having on the subject. It is a must read for anybody who cares about the future of our cities." Chapter 38. Did SFpark Work? Donald Shoup, FAICP, is Distinguished Research Professor of Urban Planning in the Luskin School of Public Affairs at the University of California, Los Angeles, USA. Read more about parking benefit districts with a free download of Chapter 51.